I made myself a really quick and easy lunch on Friday afternoon. It can be assembled within 35 minutes – with 30 minutes actually spent waiting for the garlic and tomatoes to roast, the water to boil and the pasta to cook. There’s really not much skills involved here except to cook a good pot of al-dente pasta and to pan-fry two eggs. 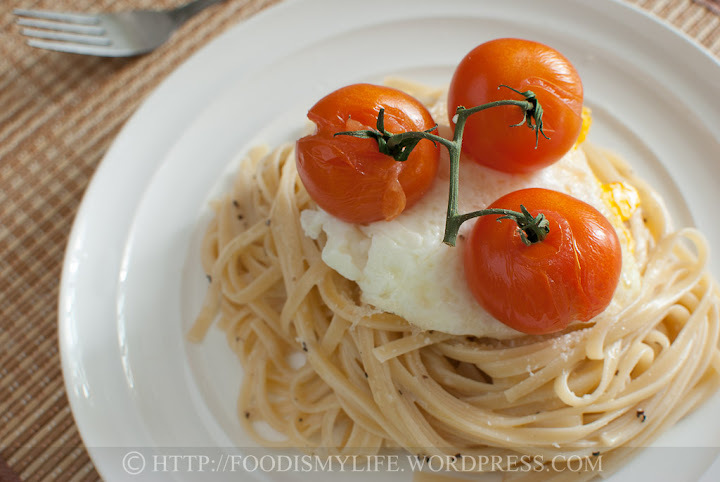 The pasta should be cooked but still firm – mushy pasta’s still acceptable but it won’t taste as nice. Overall, the garlic taste is not very strong in my opinion, and the amount of cream used is just right – not too overly creamy, making this pasta light and tasty. Though I over-cooked the egg a little, but it’s still got some oozing yolk… who doesn’t love oozing yolk? 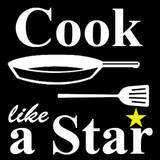 Do join in the Blog Hop event hosted by Zoe from Bake for Happy Kids – Cook Like a Star! Preheat the oven to 180 degrees Celsius. Wrap the garlic cloves in aluminum foil. Roast the garlic cloves for 30 minutes until they are tender. Squeeze the softened garlics from their skins and mashed with a fork. Set aside and keep warm. Wash and drain the cherry tomatoes. Place it in a roasting dish and roast for 15 to 20 minutes until the skins are wrinkly. Pan-fry the eggs until the whites have set but the yolks are still runny. Bring a large pot of water to boil. Salt the water (1/2 tablespoon of salt to every litre of water). Once the water has come to a boil, add in the linguine / spaghetti and cook until al-dente. Reserve a small bowl of pasta water. Drain the pasta (don't have to drain it totally and do not rinse the pasta) and return the pasta back to the pot. Add in the mashed garlic, cream, Parmesan and black pepper. Toss to mix them altogether. Add in the pasta water bit by bit for lubrication if needed and add in additional salt, black pepper or cream if desired. A delicious quick and easy lunch. Yum! This looks delicious (and beautiful photo, too)! Yea it’s going into my lazy-meals-list! (: your blogs amazing! Thanks for stopping by too (: have a great week ahead! Thank you! It’s a garlicky, creamy and delicious! Wow thanks for letting me know. I’m gonna go check it out! 😉 Thank you for the compliments! 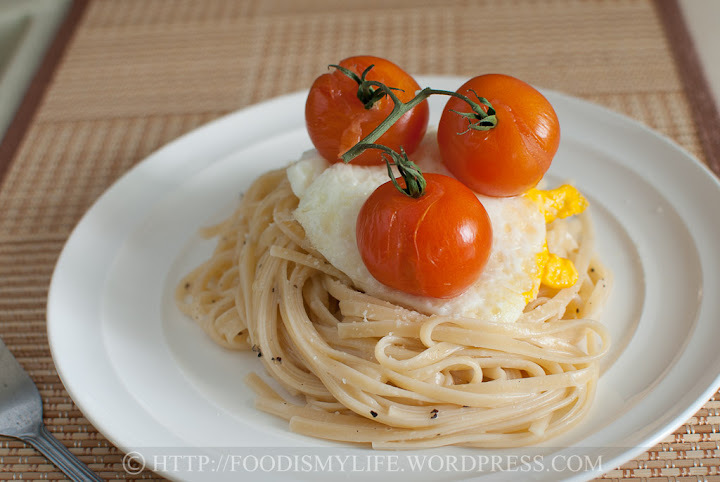 I like the idea of having oozing egg yolk with my pasta… feel like drooling thinking of this idea. I like the idea of having roasted garlic with my pasta and I can imagine the smell of roasted garlic must be very enchanting. I was just going on about a nice soft, over-easy egg with spree’s post and then, ta-da, like magic, here is one in all it’s glory! Bathed in garlic and cream sauce atop pasta.. just perfect! !